TARGET: Staff of Banks and Financial Institutions. To deliver great value to the staff of Banks and financial institutions who are our clients. 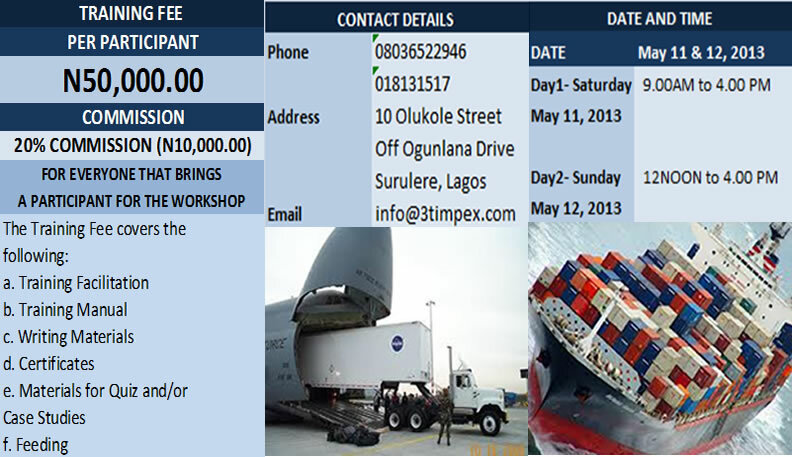 Trade operations and Finance units) and numerous Trade Certifications which include Certified Documentary Credit Specialist (CDCS), International Standby Practice (ISP) Master, UCP 600 Upskill, International Trade Specialist (ITS), Advance Certificate In International Trade (ACIT) and Finance of International Trade (FIT) to mention a few. Understanding the Principles and Applications of Trade Rules and Articles is one of the international trade training programmes of 3T Impex Consulting Limited. It covers 7 different trade rules and articles of the International Chambers of Commerce and these include: Uniform Custom Practice (UCP600), International Standard Banking Practice (ISBP), Uniform Rules for Bank to Bank Reimbursement (URR725), International Standby Practice (ISP), Uniform Rules for Collection (URC522), International Commercial Terms (Incoterms 2010), Uniform Rule for Demand Guarantee (URDG).